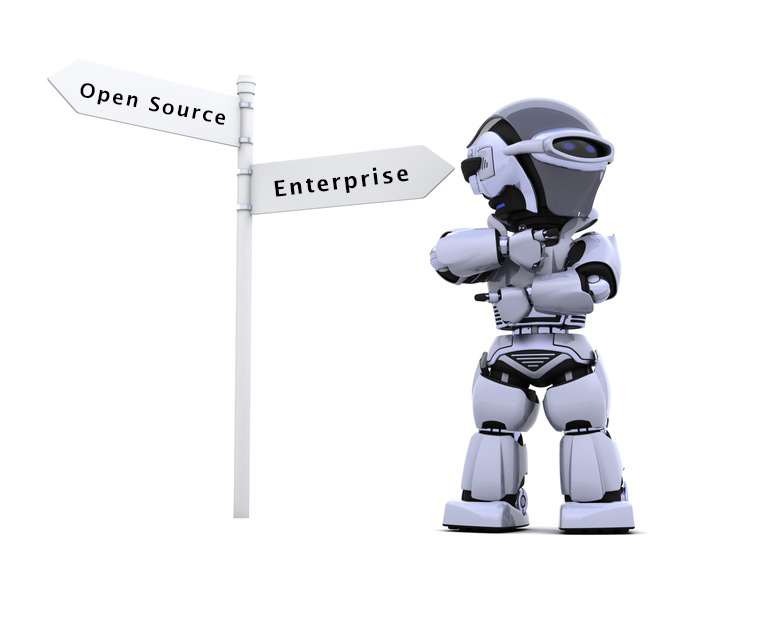 Open Source tools have been around for years, and it would seem that the downturn in the economy over the past few years, has pushed the use of these tools into the forefront of management consideration, like we have never seen before. There is often something quite intangible, and some would say magical about using a free solution, and one that has particular steer in the psyche when looking at software tools. However… as you will see from the previous sentence… it is all too easy to mix the words “free” and open source” together as meaning the same thing. What people forget when caught up in the religious zeal of open source is that there is a real tangible cost of implementing this type of solution, which often far outstrips the cost of a paid commercial product. Indeed… if people were just to slow down and pick the correct tool for the job, many would see that the commercial world of software has also changed exponentially over the same short period, and I certainly would argue now offers a more attractive overall packaged solution than any you would expect to find in the “free” world! Many teams these days have limited technical experience with automation. Yes you may have automation experts in the team etc. but scratch the surface and you will find limited experience past HP QTP, or anything outside a total all consuming indoctrination of HP UFT. Even worse is the team with an automation guru, where his or her technical skill set is so one shop and biased towards a particular form of vegetable (cucumber, gerkin). In this instance the team will struggle to any other type of testing, and be left high and dry and open to ransom demands if he or she chooses to leave etc. 1. Free / open source tools are very technical to setup and run. You will have to hire in, or technically train resources to implement and maintain your testing solution going forwards. This is very costly and restricts you to a particular technology and process moving forwards. You will find that your resources become developers, and it breeds a mentality of tester “fencing”, as I call it, where employees erect “Chinese walls” around what they develop, so that they become indispensable and therefore impossible to replace. 2. Free / open source tools require technical development. Rarely, rarely, rarely are these tools “out of the box solutions”. All extra work, extensions, addins, bug fixes, issues etc. is work that you will have to pay for and develop yourselves. Can you afford this cost? 3. Free / open source tools require internal support. Like the previous points, you will have to hire in, or technically train a leader to implement and maintain your testing solution going forwards. This presents a problem when sickness or holidays or etc. come into play. Resource unavailability could seriously mean your inability to test for the amount of time your resource is unavailable. Can you really afford this situation? 4. Free / open source tools can disappear at any moment. There are numerous examples on the web, where companies have implemented a testing tool and embedded it into their testing framework, only to find that the project dies, or is taken over by a commercial vendor, which then charges for you to continue using new releases moving forwards. Free to start, could mean an escalation of unknown huge costs in the future. Many companies charge a support fee. In most cases it would have been cheaper to buy a commercial solution! 6. Free / open source tools are bound by different licensing. You need to be very careful what you do with open source and free tools. Free does NOT mean that you are free to do ANYHING you want with the software in many cases. For example… Most open source or free tools are covered under GPL. GPL licensing requires you to distribute any derivative work as open source under GPL. This is known as “copyleft”. The practical impact is that if you write a any new feature, plugin or enhancement, it is in terms of GPL considered to be a derivative work of the tool, and therefore covered by GPL. I.e. If you decide to distribute your work to a 3rd party, you have to do so under GPL, and with the full source code. If you do not… you can be prosecuted. 7. Free / open source tools rarely integrate in with other tools out of the box, without development of integration features and plugins etc. Again… work that you will have to do yourselves. Can you afford all the above 7 deadly sins… I wonder… is the open source world looking less free, and commercial solutions more attractive… I hope so… but then I would, wouldn’t I!